In this study we examined who tweeted academic articles that had at least one Finnish author or co-author affiliation and that had high altmetric counts on Twitter. In this investigation of national level altmetrics we chose the most tweeted scientific articles from four broad areas of science (Agricultural, Engineering and Technological Sciences; Medical and Health Sciences; Natural Sciences; Social Sciences and Humanities). By utilizing both quantitative and qualitative methods of analysis, we studied the data using research techniques such as keyword categorization, co-word analysis and content analysis of user profile descriptions. Our results show that contrary to a random sample of Twitter users, users who tweet academic articles describe themselves more factually and by emphasizing their occupational expertise rather than personal interests. The more field-specific the articles were, the more research-related descriptions dominated in Twitter profile descriptions. We also found that scientific articles were tweeted to promote ideological views especially in instances where the article represented a topic that divides general opinion. The authors would like to thank MSc. Jonne Lehtimäki for insightful comments on the article. This research was financed by The Finnish Ministry of Education and Culture’s Open Science and Research Initiative 2014–2017 (funding number: OKM/33/524/2015). Brigham, T. J. (2014). An introduction to altmetrics. Medical Reference Services Quarterly, 33(4), 438–47. Retrieved from http://www.ncbi.nlm.nih.gov/pubmed/25316077. Hadgu, A. T., & Jäschke, R. (2014). Identifying and analyzing researchers on twitter. In CEUR Workshop Proceedings (Vol. 1226, pp. 164–165). doi: 10.1145/2615569.2615676. Holmberg, K. (2014). The meaning of altmetrics. IATUL annual conference proceedings, (Vol. 35, pp. 1–11). Retrieved from http://search.ebscohost.com/login.aspx?direct=true&db=llf&AN=97787073&site=ehost-live. Ke, Q., Ahn, Y.-Y., & Sugimoto, C. R. (2016). 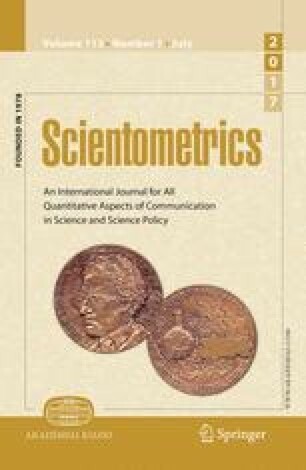 A systematic identification and analysis of scientists on Twitter. Digital Libraries; Physics and Society. Retrieved from http://arxiv.org/abs/1608.06229. Lambiotte, R., Delvenne, J.-C., & Barahona, M. (2008). Laplacian dynamics and multiscale modular structure in networks (pp. 1–29). arXiv Preprint arXiv:0812.1770. doi: 10.1109/TNSE.2015.2391998. Mislove, A., Lehmann, S., Ahn, Y., Onnela, J., & Rosenquist, J. N. (2011). Understanding the demographics of Twitter Users. Artificial Intelligence, 554–557. Retrieved from http://www.aaai.org/ocs/index.php/ICWSM/ICWSM11/paper/viewFile/2816/3234. Nelhans, G., & Gunnarsson Lorentzen, D. (2016). Twitter conversation patterns related to research papers. Information Research, 21(2). Retrieved from http://www.informationr.net/ir/21-2/SM2.html. Patton, M. Q. (2002). Qualitative research and evaluation methods. Qualitative Inquiry (Vol. 3rd). doi: 10.2307/330063. Priem, J., & Costello, K. L. (2010). How and why scholars cite on Twitter. In Proceedings of the ASIST Annual Meeting (Vol. 47). doi: 10.1002/meet.14504701201. Semertzidis, K., Pitoura, E., & Tsaparas, P. (2013). How people describe themselves on Twitter. In Proceedings of the ACM SIGMOD workshop on databases and social networks—DBSocial’ (Vols. 13, pp. 25–30). doi: 10.1145/2484702.2484708. Uddin, M. M., Imran, M., & Sajjad, H. (2014). Understanding types of users on Twitter. arXiv Preprint, 6. Retrieved from http://arxiv.org/abs/1406.1335.